"So, on a scale of one to Jelly World, how doomed are we?" A tile fell off the roof, clattering morosely on the debris. 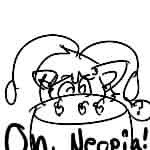 "I think we're hovering somewhere between Illusen and Jhudora hugging, and Doctor Sloth successfully invading Neopia." Based on a true story, actually. Ready to Roll. It's the perfect game: the mouse controls are simple enough, just click and drag, so easy that you can even play the game on a laptop with a track pad rather than an actual mouse.